In an unassuming little plaza sandwiched between the perpetually snaking McDonald's drive-thru and the rest of a plaza, is an often-raved southern BBQ place called Buster Rhino's. Here, patrons can order hot food made to order, or bring home frozen deliciousness to reheat at a time of their convenience. I have not gone to the other locations before. This is more of a take-out place, with only one table and 4 chairs for you to sit at if you so choose! When ordering a sandwich, by default you receive a side (i.e. fries, coleslaw, beans, etc.). I ordered a pulled pork sandwich with fries and original sauce and a braised beef with coleslaw and smokey bourbon sauce. If you're a little squeamish about saucy messes, either grab more napkins or...wear a body suit? The sandwiches had a great amount of meat, however...the bread could be a little smaller. However, it's good to know that the sandwiches would fill you up with its gluteny-goodness. Speaking about gluten...they DO have gluten-free items, such as the fries! And they're pretty good fries! Not overly crispy, not soggy, just the right amount of seasoning/salt. Their poutine would be something to consider, as they purportedly use cheese curds! Stay away from the coleslaw, unless you like it watery with strong vinegar/sour taste. The bourbon sauce is amazing. Get it! Perhaps it was the time I showed up, or perhaps it really IS just the one gentleman taking care of the cash AND the food preparation...but either way, he was friendly and helpful in answering questions. And yes, he washed his hands or used food gloves to work with the food. A worthy (and friendly!) 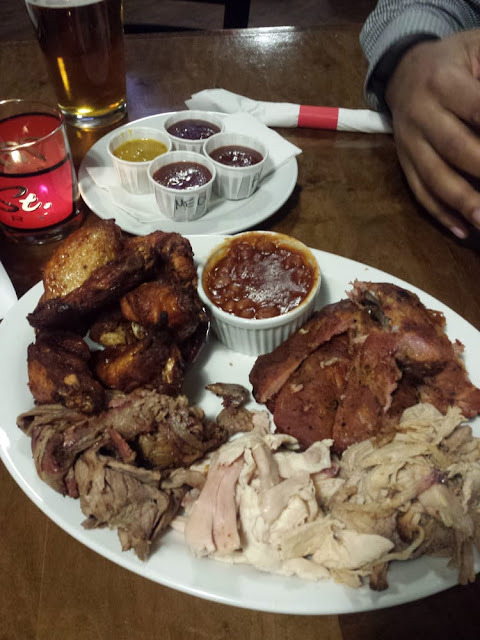 place to grab some BBQ in the north Oshawa area. Experiment with the various sauces, and you're bound to find one you really like. 0 Response to "Buster Rhino’s"